Class 1 completed some fieldwork. They walked around the area surrounding school, identifying the different types of homes. We saw: terraced houses, high-rise flats, flats, semi-detached houses, maisonettes and a bungalow! In science, the children in class 1 have been learning about looking after pets. Miss Spinks brought her pet guinea pig to visit us. We thought he was very cute and got to stroke him and feed him. We learned that he needs food, water, shelter and lots of cuddles! Class 1 visited Abbey House Museum to learn about homes long ago, with no electricity. The children had to work very hard cleaning and washing. They also sorted pegs into 'new' and 'old'. Class 1 made a fresh fruit salad. They learnt about the 'bridge' and 'claw' cutting/ chopping skills. Class 1 had a fantastic day as part of their geography and science work learning about 'Winter'. They learnt about: hibernation (playing a game), made snowy owls, made gnomes which they dressed in warm clothes, made dens for shelter and explored the environment looking for signs of winter. Class 1 had a great time at the Thackray Medical Museum learning the names of our different teeth and the job they do. We also explored the Museum and learnt about our bodies. 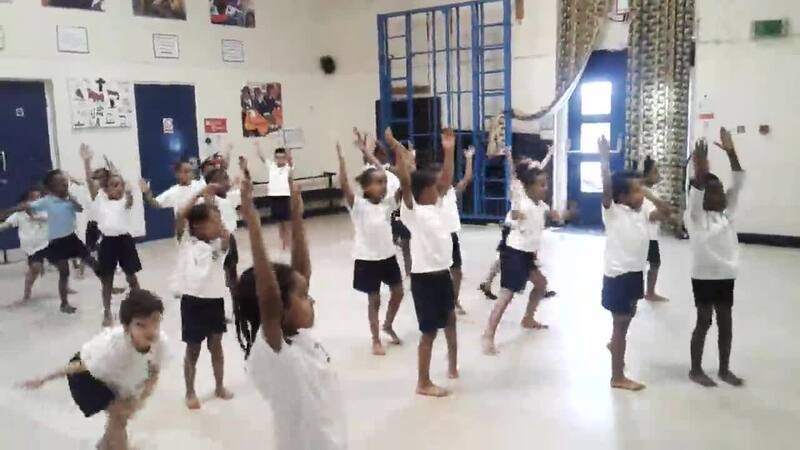 Class 1 had a fantastic time learning Indian Dance as part of our International Week celebrations. Ladi's Grandma visited Class 1 to talk about what it was like growing up as a little girl in the past. The children asked some interesting questions and were surprised at her answers! " No McDonalds, computers or Roadblox!" Class 1 have enjoyed using small and large apparatus in P.E. They have been thinking about tuck, straight and star shapes. Class 1 have been learning about Baptism and having a sense of belonging in R.E. We visited Leeds Minster, taking 'Rosie' the class 1 doll to be baptised. Class 1 had a super day at Cannon Hall Farm, they visited the new 'Reptile House' as part of their English and Science work. Class 1 met Katie Rushworth from ITV's programme 'Love your garden'. They learnt how to 'squeeze, tickle and put plants to bed'. Thyme, rosemary and lavender herb plants are now growing well in the food hall at Leeds City Market. Class 1 did an amazing assembly! The children have been reading lots of different stories. We enjoyed hearing all about them. Class 1 had a step back in time on their recent visit to Abbey House. Monday was wash day, no electricity meant no electric irons, washing machines or tumble dryers. We learnt that houses had no bathrooms and the toilet was outside. Class 1 had a fantastic day at Skelton Grange as part of their Geography and Science work about Winter. They pretended to be hedgehogs, made winter crafts, explored the woods, made houses for their gnomes and finished the day around a fire eating freshly popped popcorn. Class 1 visited Thackray Medical Museum for a workshop on Teeth and Healthy Eating. They learned about the jobs our different teeth do and they did a messy experiment where they learn what happens to our food after we've eaten it! They also had a look around the Life Zone at the museum. They had a great time and were very well behaved. Well done Class 1! Class 1 went on an autumn walk to look for seasonal changes as part of their geography work. Class 1 went on a trip to Temple Newsam House to look at Portraits as part of their Art work. They looked at portraits and made a 3D life size portrait. They also had the opportunity to dress up as characters from long ago and sketch some portraits. Class 1 have looked at some art work by Andy Goldsworthy. The materials used in Andy Goldsworthy's art often include brightly coloured flowers, icicles, leaves, mud, pinecones, snow, stone, twigs, and thorns. Class 1 enjoyed having a Teddy Bear's Picnic as a reward for their hard work, running a very busy café. Class 1 visited Harlow Carr to look at different types of trees and leaves. We jumped over ditches and tip-toed past a troll! We even saw the BFG! To finish off such a busy day we played in the tree house. Thank you to all the parents who came to the 'Class 1 Café'. The children worked very hard and the customers were delighted with the service they received. Using our postcodes we found our houses on Google Earth. The children were very excited! We all bought a second class stamp and posted our letters home - an invitation to Class 1 Café on Monday 3rd July. We have all learnt our addresses and most importantly our postcodes! The route is planned, so using the maps we set off with our letters for posting. Class 1 used a street map to plan their route to the local post office to buy stamps. Class 1 had a 'Mastery Task' about capacity. It caused quite a discussion in the plenary. Please ask your children to explain the answer. Class 1 found objects around the classroom to weigh. Before weighing the objects they had to estimate the number of cubes needed. Class 1 used the information from their bird watch to create a block graph on the computers and iPads. Martha a French Bull-Dog came to visit Class 1 from the Dogs Trust. We learnt how to stay safe around dogs and how to care for them. Class 1 performed a retelling of the traditional tale 'The Enormous Turnip'. They spoke clearly and sang beautifully. The rest of school clearly enjoyed it, as did so many parents! Well done Class 1! Class 1 have been using step by step instructions to move the bee--bots on the mats. It was a bit tricky to start with but we are getting much better! In DT we learnt a safe way to cut foods using the 'bridge' and 'claw' cut. ERIC Time (Everyone Reading In Class) - the children really enjoy reading during ERIC time. Class 1 have been exploring the school grounds to see how things change in the autumn... leaves changing colours and falling from the trees. Some of the children found seeds from the Sycamore tree too! The children really enjoyed their visit to Leeds Minster and learnt about Baptism. There were some very proud 'Parents and Godparents' and no tears from the baby! Class 1 thoroughly enjoyed skipping day - they were taught lots of new skills and had a fabulous day. So much is happening in the school garden. Class 1 enjoyed relaxing in the garden to do some observational drawings.